Specializing in social media and silly stories. You can find all of the other parts here: One, Two, Three, Four, Five, Six, Seven. I’m long-winded. Rockfleet was one of the last places Grace lived – and probably where she died. It is pretty much in the water, too, because of course it is. Grace loved the sea. Anyway, after climbing all over things the signs specifically warned us against climbing, we drove on from the castle to the city of Castlebar and the Museum of Country Life. The museum hosts some really excellent permanent exhibits about day-to-day, er, country life. (Eight posts in and the quality of description is just as sharp as ever, folks.) My favorite part was a fascinating and horrifying Irish ‘headhunter’ exhibit. It is a stunning set of photographs of the native people of the west coast of Ireland in the 1890s (including some from my Clare Island, so of course I loved it). But they were taken for the gross reason of documenting a “primitive” race (the Irish), measuring their skulls to determine what made them lesser, or more likely to be criminals. The exhibit also talked about eugenics, and the portrayal of the “wild Irish” as far up as the late 20th century. Fascinating and horrifying. We didn’t really get to stop in Castlebar due to the rain, which is too bad – I know my great-great grandparents spent the last part of their lives there, and are buried somewhere nearby. Castlebar was the return address on all the letters from g-g-grandma Bridget (aren’t they all) to her daughter Mary (yep, that’s the other name Irish women can have) in the states, letters made up almost entirely of heavy-handed hints that one of her sons should enter the priesthood. Luckily for us descendants, none of them did; they fought that Irish Catholic sterotype by living in Massachusetts and having lots of children with names like Patricia (and the trifecta is complete). We spent the rest of the afternoon in doing a bit of shopping in Westport before heading back to our cottage. The owners of the cottage – who we had yet to meet – were going to come by, and mom and I were nervous. We built up a fire out of bog turf and kindling – something we had tried to do for hours our first day at the cottage and had yet to master – and waited for J & M to arrive. We hoped they wouldn’t stay long. Then they arrived, and we wished the would never leave. First of all, they finally got a roaring fire going for us. Making heat out of logs of dried dirt is not something one learns in Minnesota, but it was second nature to our hosts. Then they chatted with us about everything we’d done, our connection to the cottage, their connection to it, and what they remembered about our relatives. They didn’t know my mother’s grandfather, being only in their sixties themselves, but thought maybe one of the neighbors might. “The O’Malley girls?” M asked her husband. “Yes, or maybe Seamus Balls,” J said. At the tail end of a nearly perfect dream vacation, warmed by the fire and my nightly Guinness, I slowly became aware that these two delightful strangers with thick Irish brogues were speaking of an elderly Irish little person who might hold the answers to my family’s history – an Irish little person named Seamus Balls. I AM GOING TO MEET A LEPRECHAUN, I thought. J placed a call, got the “address” (aka end of which dirt road) of the O’Malley girls’ place and arranged for us to meet them before Mass the next morning. The evening ended with J and M refusing to accept payment for our stay. We’d been wondering all week what the charge was going to be (because, true to our ‘this will work out without any planning’ style, we hadn’t asked before), and had been anticipating a high rate because our stay could not have been better. And yet it was free, because we were, vaguely, family of someone they used to know. After J and M left, my mother and I collapsed into giggles. Seamus Balls? Free stay? The delightful J and M and soon, the O’Malley girls? Our luck is beyond measure. The next day, we had tea with the O’Malley girls, who were, of course, in their eighties or nineties. They also remembered more about our distant relatives than direct ones – those truths are with the small-but-proportional Seamus, I guess. We returned home to pack and take a trek out to a bend in the river just beyond our cottage that still bears our family name. We cut through a field (also “ours”) and visited the pool. The wind chased us back inside, where we we packed up and said goodbye to our cottage, our path, our road, and our Irish home. After one last stop – the church where my great-great-grandparents were married and my grandfather was baptized – we set out on the road. Our last day we simply cut across the country, stopping at a very nice but impersonal hotel outside of Dublin. 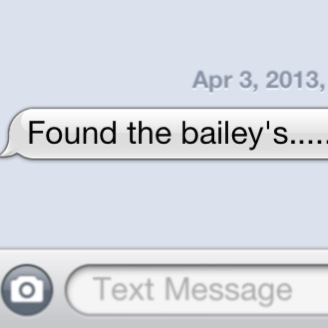 There, I had another Guinness and my mother a cider and we got sadder and sadder as we realized it was over. 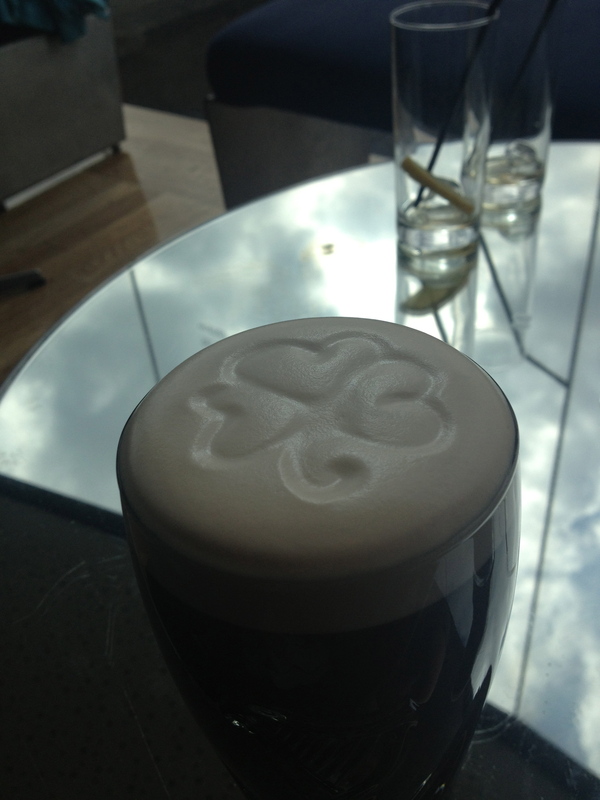 And it was – the next day was just car return, bus, airport, very fast Guinness, plane, airport, plane, taxi, home. We’ve been home for six months. It’s a year since I asked my mother if I could take her to Ireland. And it’s only, I would wager, about one or two years until our next trip back. Today, it’s been 100 years since my great-grandmother left Ireland for good. It’s been four months since my mother and I went back. And almost as importantly, it’s been a full month since I started writing about a ten-day vacation. Probably I should wrap this up…sometime. People are constantly making pilgrimages up this mountain. We climbed twenty feet to this statue and found it sufficient. Somehow, I’d never before realized this mountain was in Mayo and my grandfather was born essentially in the shadow of it. One of the first things I remember learning about County Mayo was the phrase “Mayo, God help us.” As in the response to the question, “Where are you from?” County Mayo was one of the worst hit places of the Great Famine. That’s why this monument is here, but it isn’t the only one in the county. 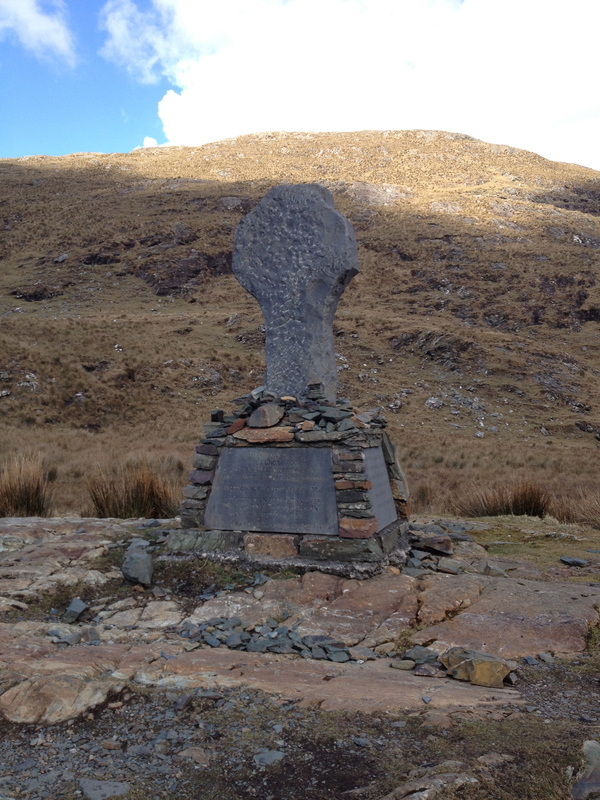 We’d learned about an event called the “Doolough Tragedy” while on our travels: In 1849, around 600 starving Irish walked from Louisburgh to Delphi Lodge, 12 miles south, in hopes of receiving food or relief from the Board of Guardians. They were turned away, and many died on the walk back – some from starvation, some from falling off the edge of the path. It is said that hundreds died. They were buried where they fell, if they were buried at all. There’s now an annual famine walk on this road, and a small monument about eight miles south of Louisburgh. 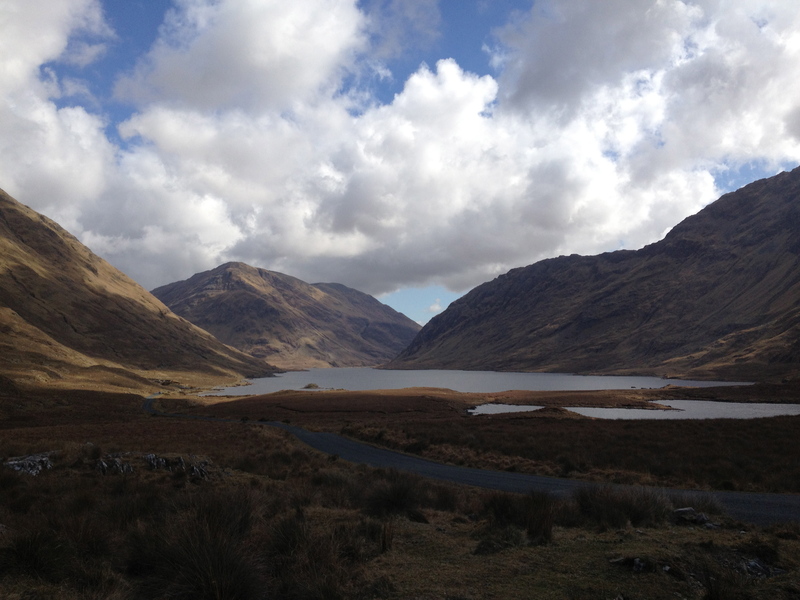 Mom and I went in search of it (in our Happy Europecar, not on foot), and somewhere along the way realized it was our second perfectly beautiful day – and that despite its history, Doolough Pass is one of the most beautiful places I’ve ever been. We spent about an hour or so wandering up and down the road, avoiding sheep and steep cliffs and saying little besides “Wow.” Then, feeling exceptionally lucky, we decided to do some grave hunting. The first graveyard I chose (completely on a hunch) was haphazard, packed, and rocky – at least, I thought it was rocky; it occurred to me halfway through our trek that I was actually walking on fallen headstones whose names had completely disappeared. And we still managed to find an ancestor. 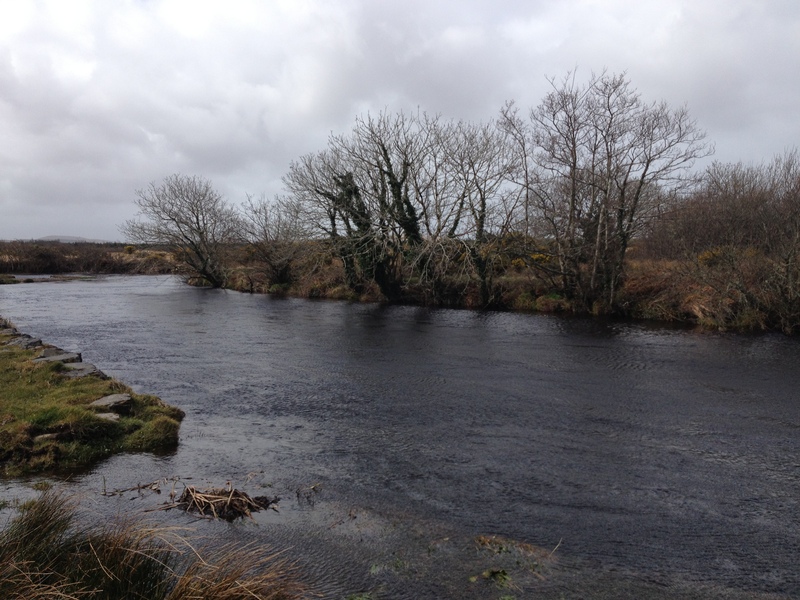 The second graveyard was even more of a hilly, discombobulated mess – and we found an ancestor there, too; ancestors who lived in Mayo during the years of the Great Famine. I still don’t know how they survived it, but I do know that when my family finally left, they were hoping to put hardship behind them. I look at where I am and all the privileges I have today, and I know they succeeded. Next up: The end. Almost. Probably. Maybe? After sufficiently freaking out about our cottage, mom and I decided to look for more of our roots in and around Louisburgh. We knew her father was born on Bridge Street; luckily there is only one Bridge Street, and it is approximately one block long. We also put my navigational skills to the test (our British Lady was a little spotty on what passed for roads in this part of the country) and found Clare Island. That’s the view from the dock of the ferry to Clare Island. In the non-tourist season, it runs once in the morning and once in the evening; this is as close as we got (this trip). My great-grandmother was born there, and generations before her. 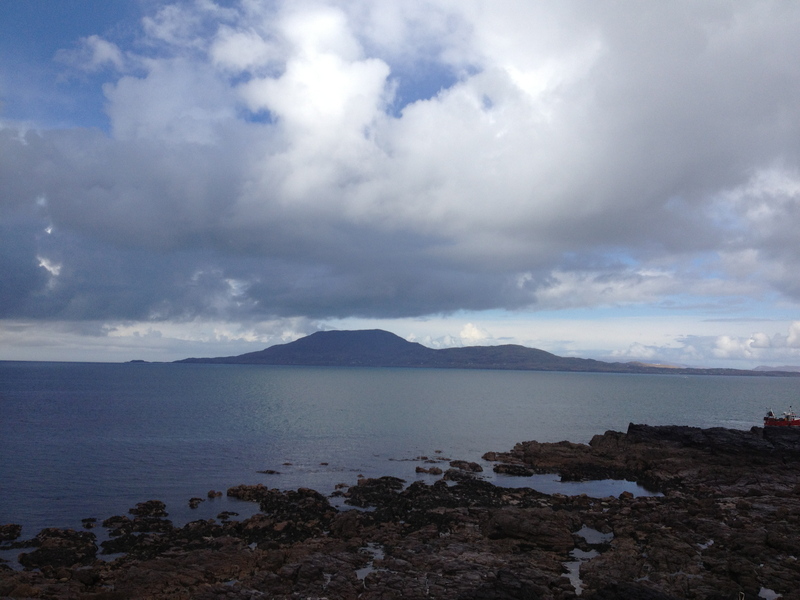 This area is called Clew Bay; Clare Island is the largest of the many small islands in the bay. For centuries, this was known as the kingdom of Umaill. 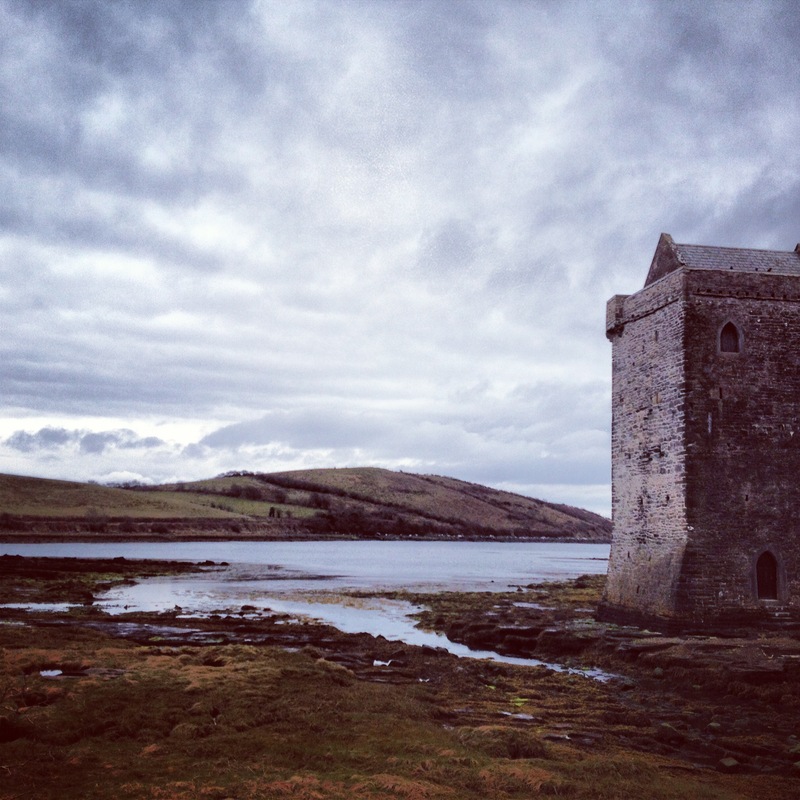 The ruling clan eventually took on the surname Ó Máille – now anglicized as O’Malley – and one of the most famous of the clan is thought to be buried on Clare Island: Gráinne Ní Mháille, or Grace O’Malley, the Pirate Queen. Everything about Grace is fascinating to me, and not just because we have a connection to her. She was educated. 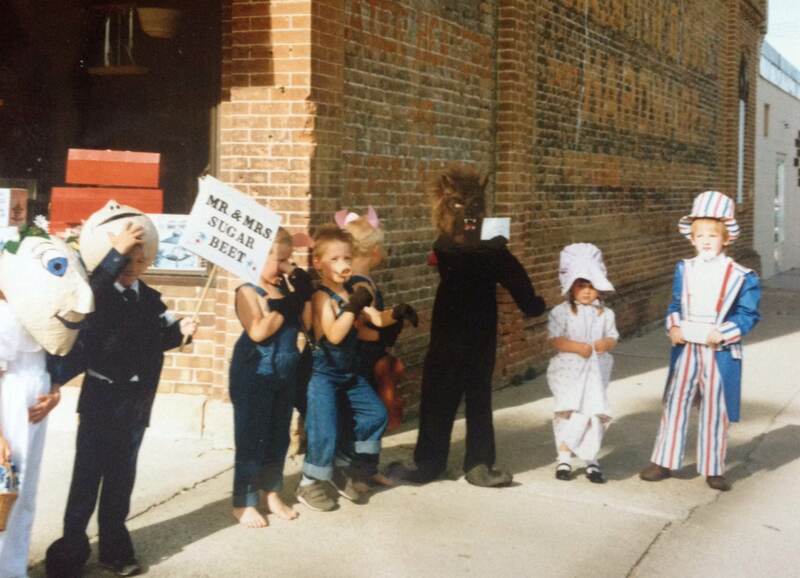 She was fierce. She faced off with Queen Elizabeth. She was an independent, strong woman at a time when that was rare, and she is still remembered 400 years after her death. I know her life was probably harsh, and she was harsh, and to romanticize pirates is a silly thing – but still. She’s worth remembering. 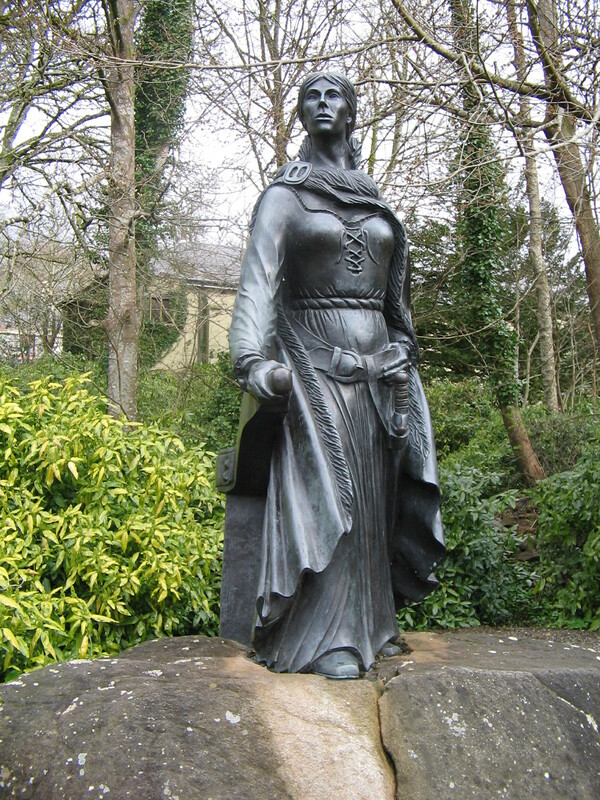 That statue of Grace is displayed on the grounds of the Westport House, the estate owned by the 11th Marquis of Sligo – Grace’s direct descendants. We made a stop at Westport House our second day in Mayo after a brief stop at the tourism office. 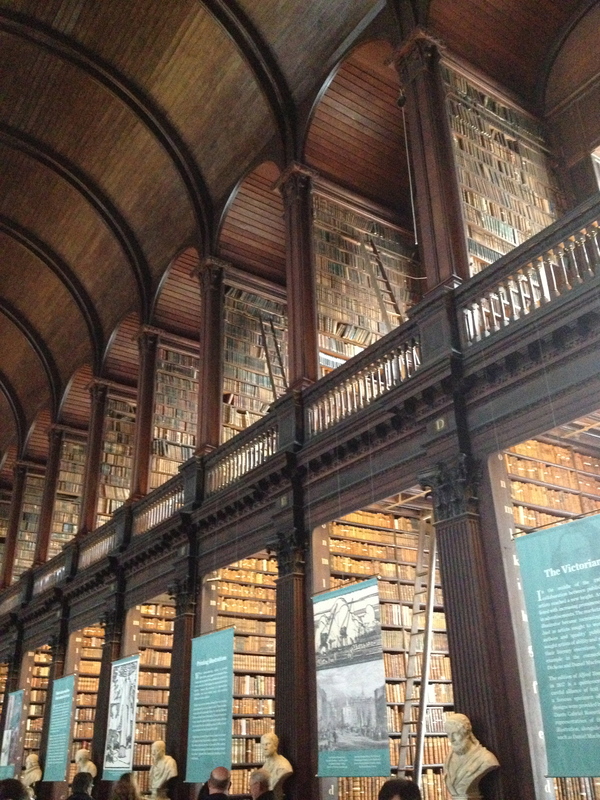 We had the whole place to ourselves – and it was quite the place. To recap: direct descendants got this; descendants of those who fought for her…cottages and tenant farms. 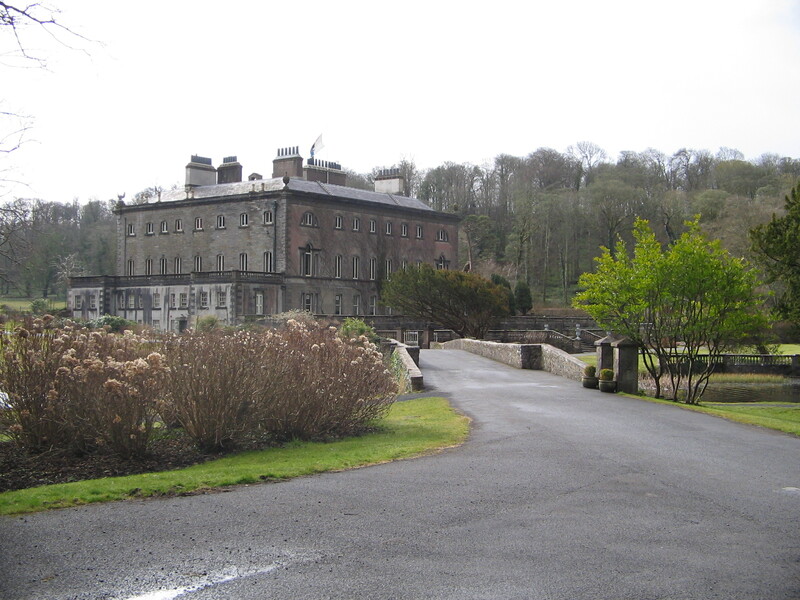 Westport House is built on the remains of the dungeons of one of Grace’s castles. Rather unfortunately, the dungeons are now decked out with gaudy pirate decorations. 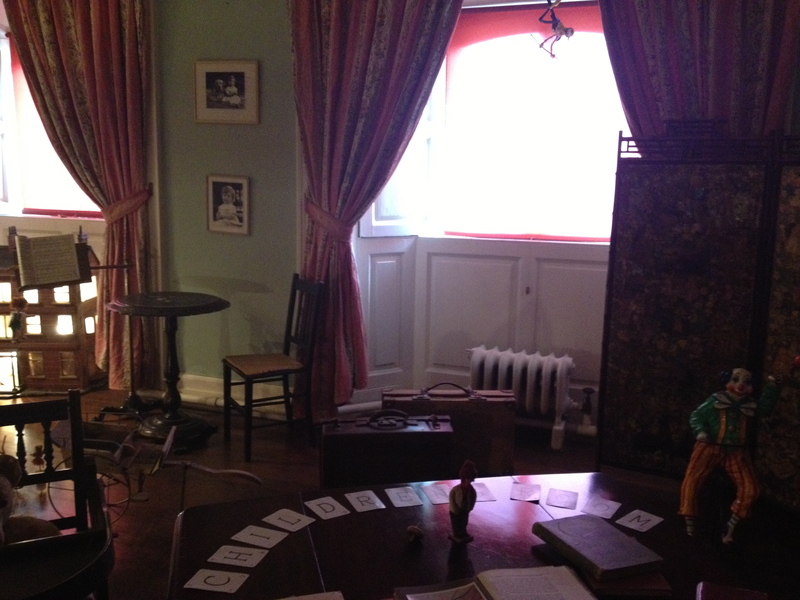 This was my favorite room in the house, called “the children’s room.” See how many horrifying things you can spot! Personally, I like the doll hanging from the music stand. It forms an event in one’s life to have seen that place, so beautiful is it, and so unlike other beauties that I know of. Were such beauties lying on English shores, it would be a world’s wonder, perhaps if it were on the Mediterranean or Baltic, English travellers would flock to it by hundreds, why not come and see it in Ireland. 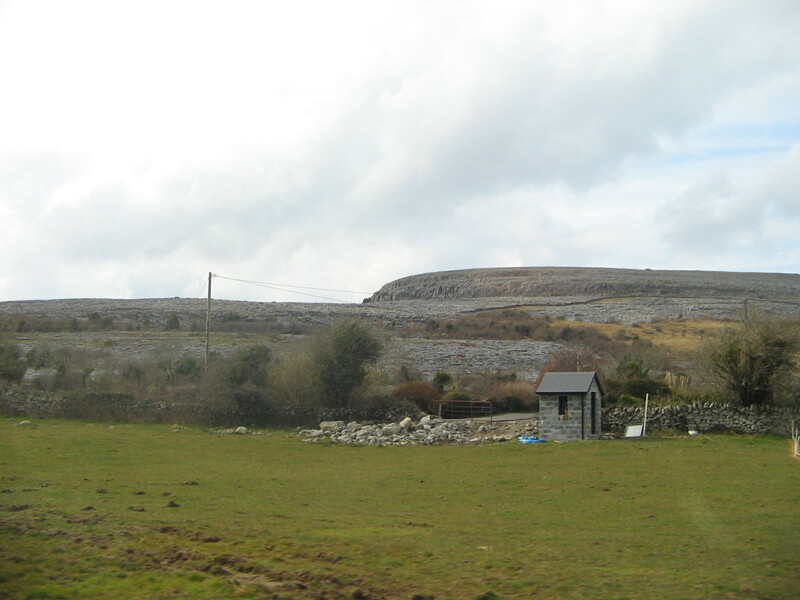 After the Cliffs of Moher, we drove north towards through a unique rocky landscape called the Burren. 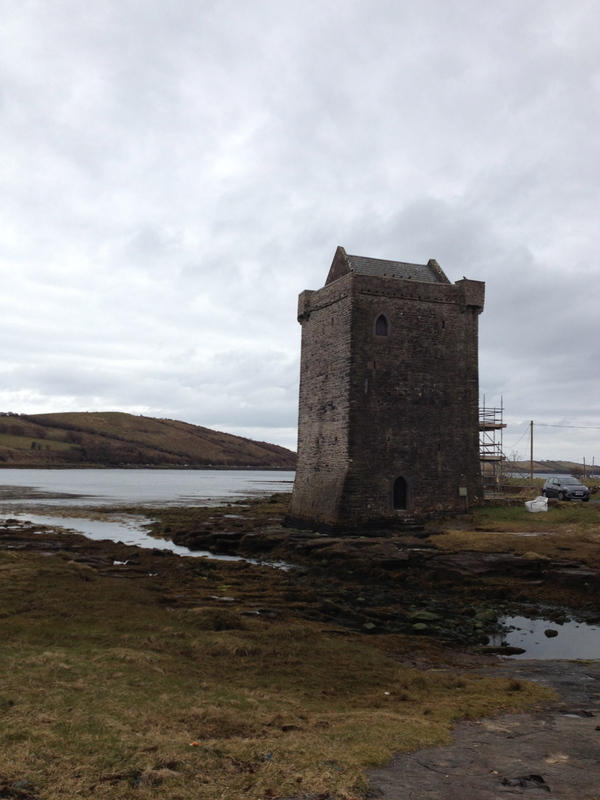 We also stopped for a rain-soaked fifteen minute visit to Dunguaire Castle, which is pretty much just a castle on the side of the road. 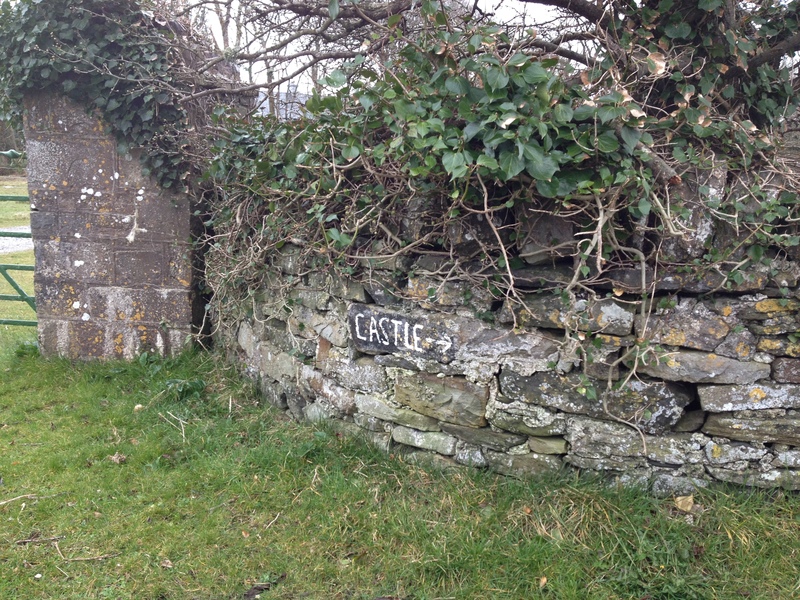 But still, it’s a castle on the side of the road. It’s neat. 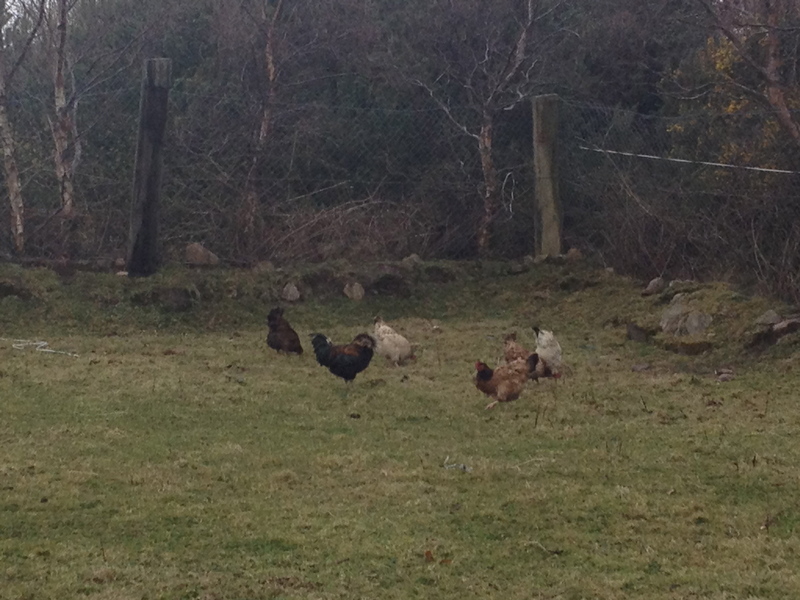 We spent the night at a B&B outside of Galway, and the next morning started north for County Mayo. County Mayo had already reached mythical status for me; it is a place I’d been hearing about my entire life from people who had never been there. I should have been very excited to finally reach it, and I was – but more than anything, I was nervous. You see, for every other part of our trip I had pre-booked a hotel or B&B. For this part, I had lined up housing in a different way. 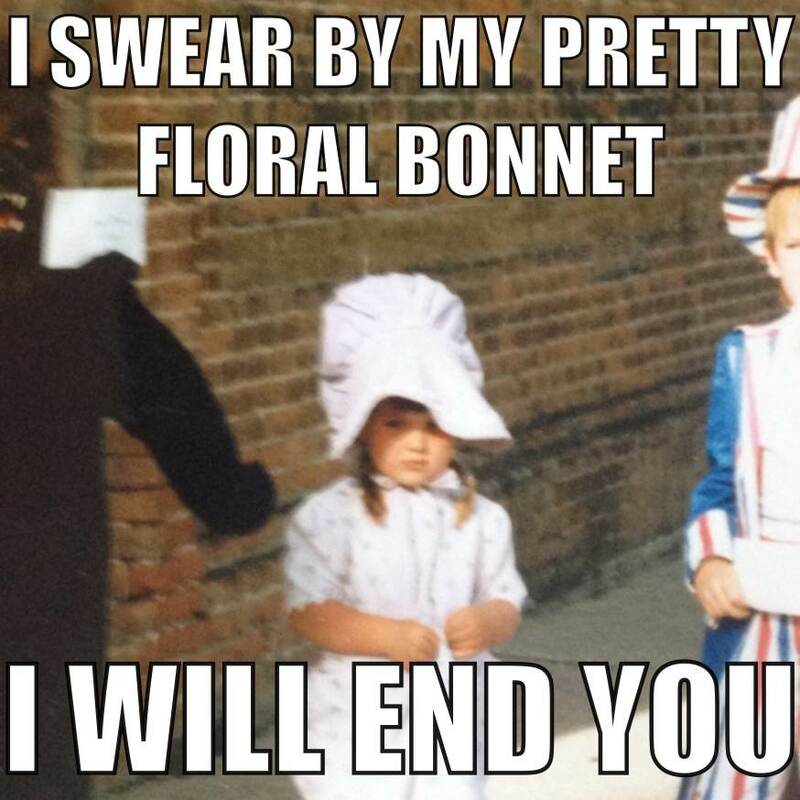 Through my genealogy research and epic Google skills, I’d become somewhat acquainted with a distant cousin in England. She had recently gone to Mayo and discovered a cottage formerly owned by one of our ancestors, and had given me the phone number of the current owners (whom she had not met and who bore no relation to either of us) a few months prior. Being a chicken, I had asked my mom to call the current owners and ask if we could rent the place. Being overexcited, mom did so but forgot to ask what the place was like, what it would cost, or how to get there. 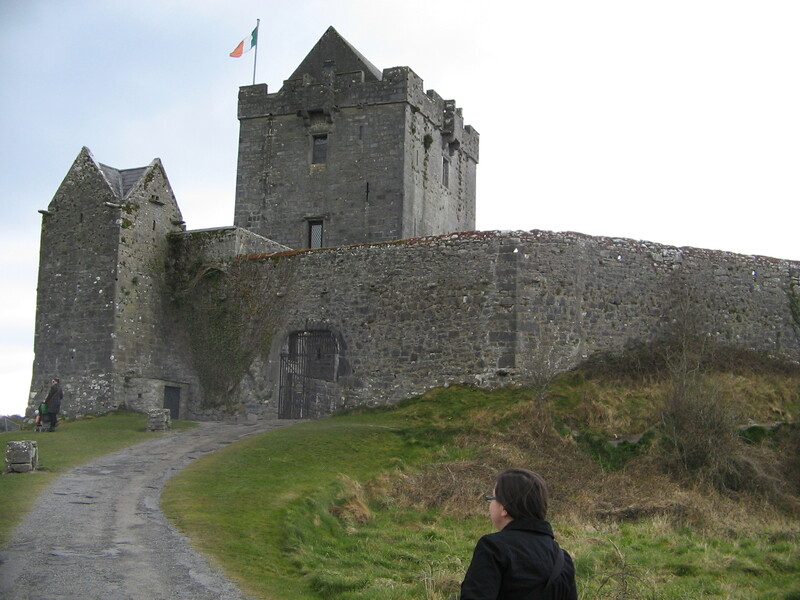 And we didn’t follow up until we were already in Ireland. And then, again, we failed to ask the cost or what to expect. We arranged to meet the daughter of the owner in a parking lot of a Tesco in Westport. A woman pulled up, said “follow me please!” and we did. For about fifteen curvy, country road minutes, during which time we a) wondered if we were even following the right person and b) told each other that if it was terrible, we would find a B&B. Are you with me so far? A complete stranger from Ireland is leading two clueless American tourists into the middle of nowhere solely on the advice of a different stranger from England. I would say this is the beginning of a horror movie, but even horror movie characters aren’t this dumb. When we turned down the final lane (no street name, nonexistent to our British-lady-GPS, and marked only by a bike path and yield sign), we were greeted by The Cottage. I won’t picture it here out of courtesy to the owners, but when you Google “Irish Cottages,” this is the cottage that comes up. When you go to a gift shop and buy a magnet of a cottage, it is this cottage. From the bright red door, the thick white walls, the simple wooden fence and the stunning view of the countryside – The Cottage was exactly as it should be and yet totally unexpected. Once inside, we were not met with the rustic conditions and/or horror movie situation I’d been fearing, but instead a lovely turf fire, classical music on the radio, and brown bread on the counter of an updated and well-furnished home. Luck does not begin to explain it. 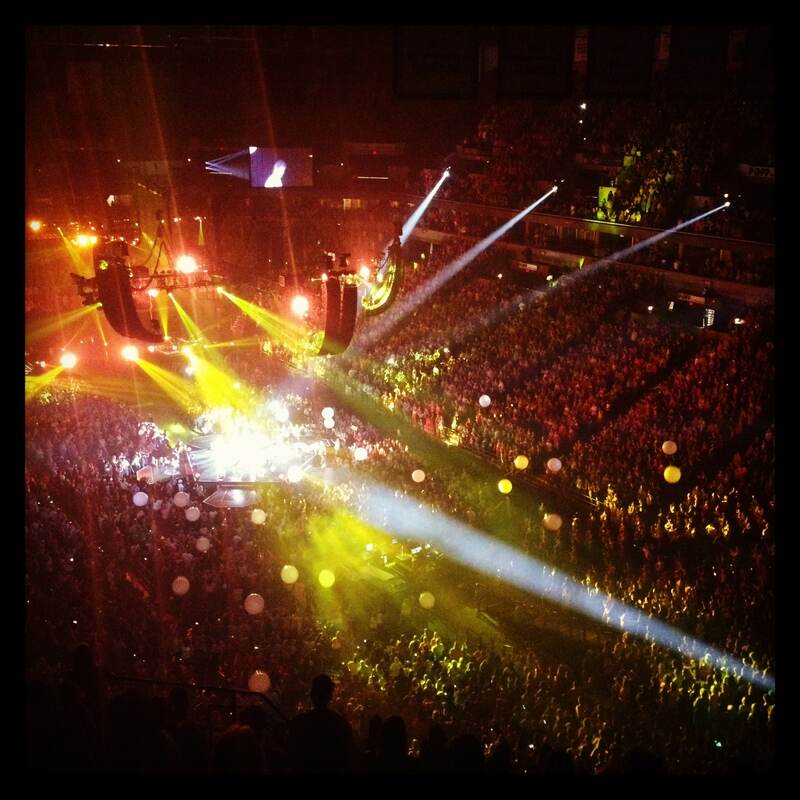 This place, and how we got there, was a miracle. And for the first time in our trip, we knew for certain — our family had been in this place. My great-great uncle lived there; we know his brother, my great-grandfather lived a few miles away. We can guess he visited this home. I’d hope their mother and father had at some point as well. Who knows? Maybe even my grandfather himself, as a baby. The cottage may be updated, but the scenery has not. 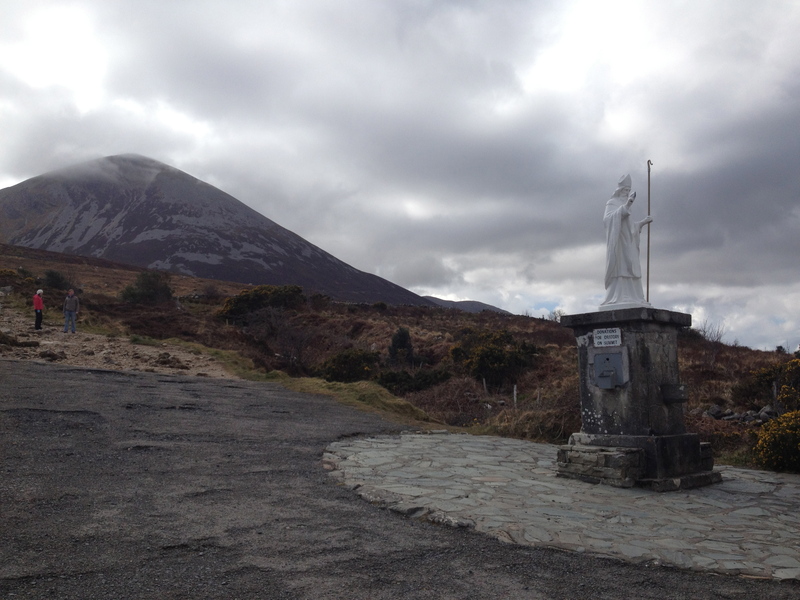 Look one way, and see Croagh Patrick, the mountain where Saint Patrick fasted for forty days in 441 AD. Look another and see a field and a simple bend in a river that still holds my family name. 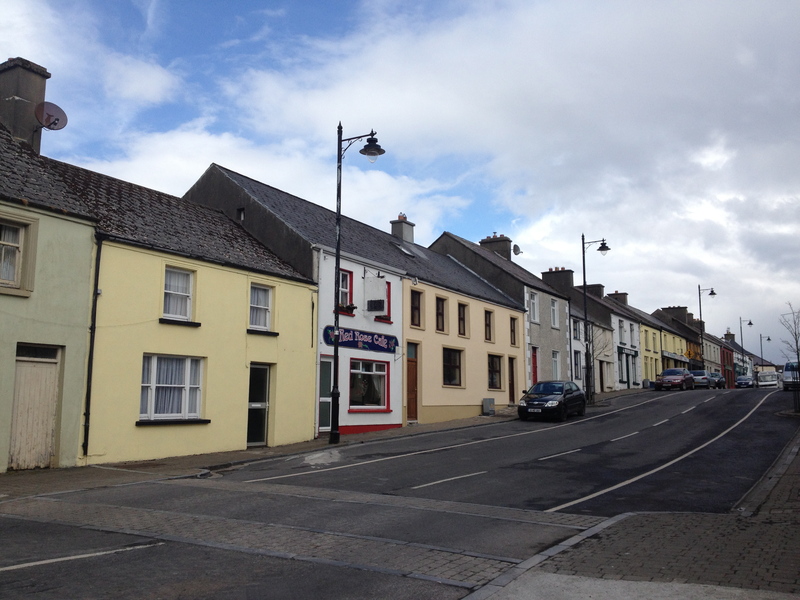 A few miles down the road, Louisburgh, the birthplace of my grandfather. 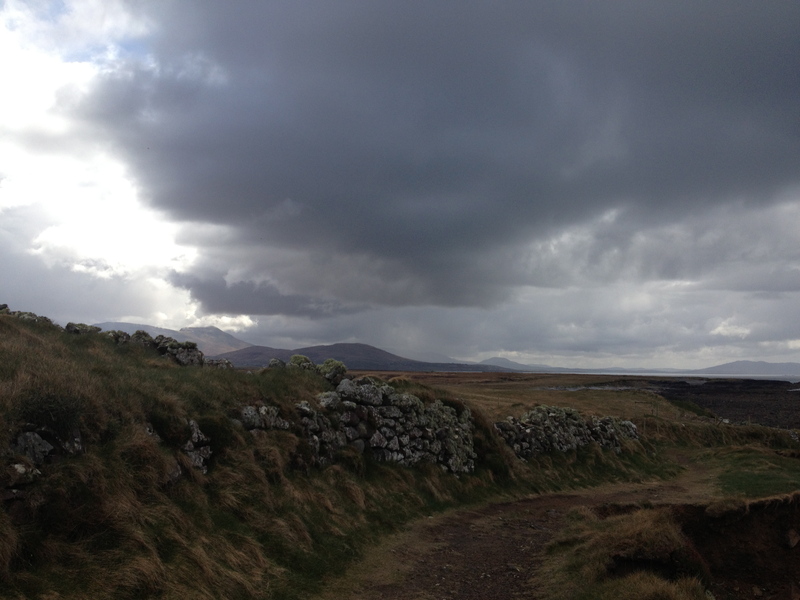 And beyond that, Clew Bay and Clare Island – more steps into my past. And all of it – beautiful. I may not know how my family survived the famine in one of the worst-hit areas of Ireland, but I can see why they did not want to leave. 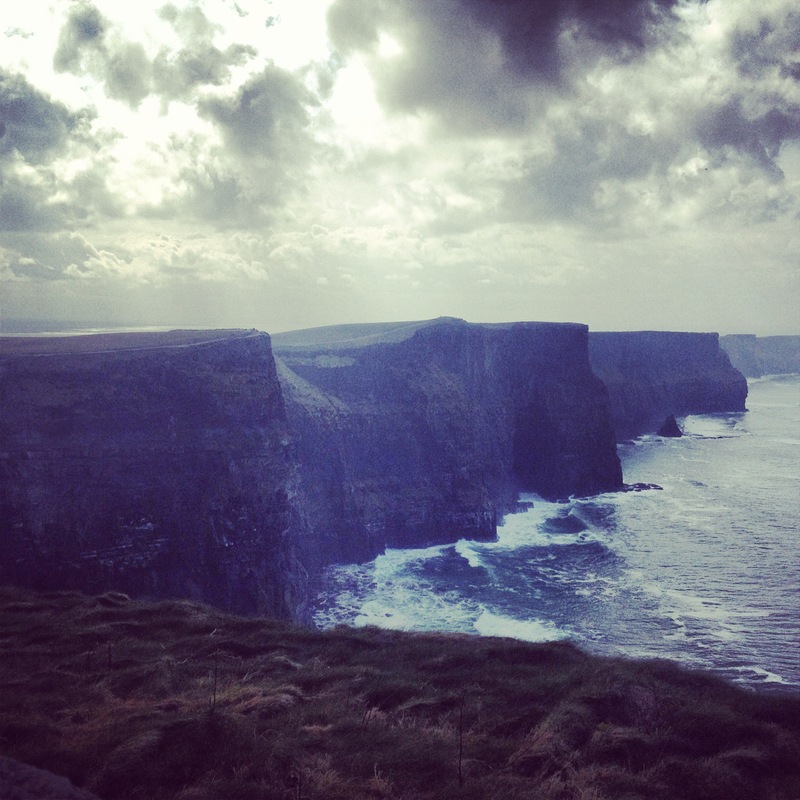 Have you heard of the Cliffs of Moher? How about the Cliffs of Insanity? It’s no secret that I love-beyond-love the story The Princess Bride. 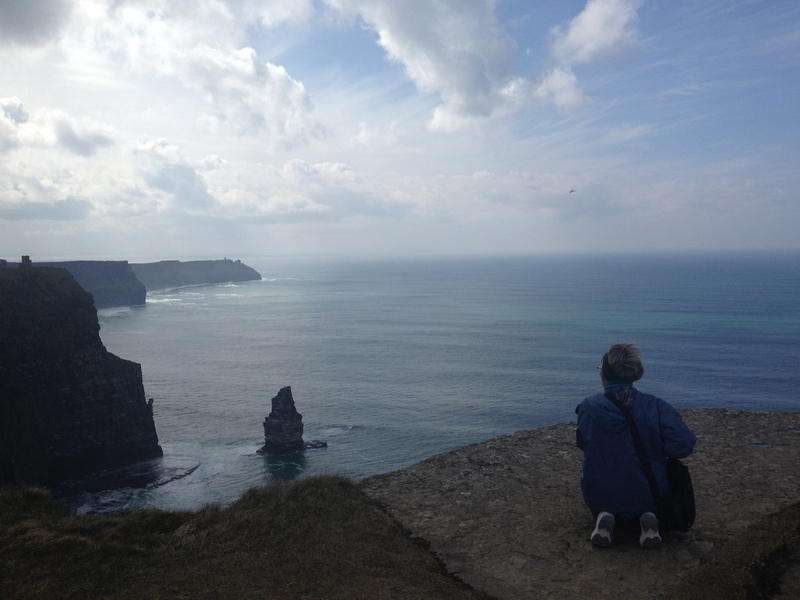 So once I learned the Cliffs of Moher were used as the Cliffs of Insanity in the movie, I knew I had to visit. It was actually the first site I put on our itinerary after purchasing the airline tickets. 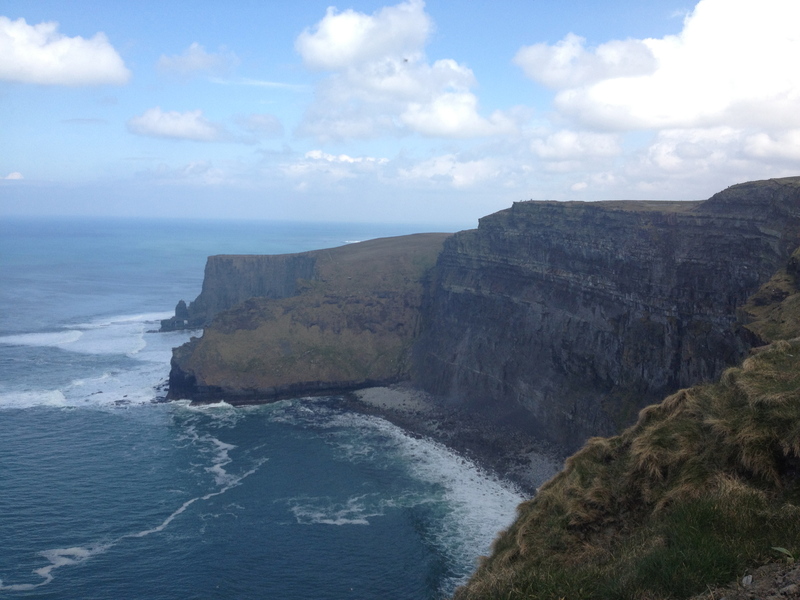 We drove north from Killarney, skirted around Limerick, and arrived at the Cliffs about mid-day. You can’t see them from the road, so we just took it on faith that we were in the right place – that and the signs and parking lot. 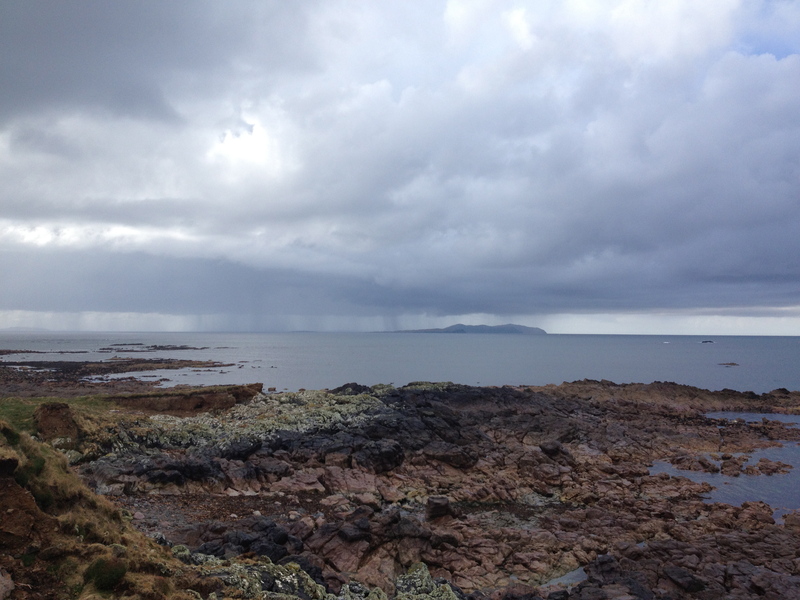 It was a surprisingly sunny day, so when we walked up to the cliffs, they looked like this. People were surfing down there. Inconceivable. There were immediate tears, and not from the one of us you would expect. Okay, yes, from that one, but the other one, too. 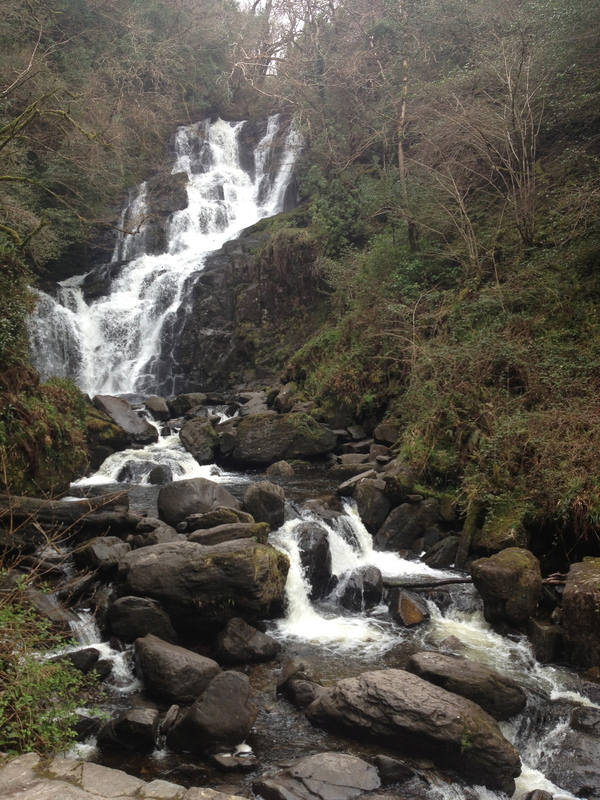 In terms of sheer gorgeousness, this was one of two perfect days in Ireland. We spent several hours there, walking along the edge first one way and then the other. There’s a “path” for a while, but there’s really nothing to stop a person from going beyond it except a sign saying it’s crazy dangerous right next to a sign memorializing all those who have lost their lives at the Cliffs. We were adventurous, but not too adventurous. Aside from a brief flare up of my mom’s situational vertigo, it was a perfect day. There’s not much more I can say about this; the only way this day could have been better is if Mandy Patinkin and Cary Elwes showed up to duel. After saying farewell to Cobh and getting into our only “fight” (which was really just me yelling things because I hit a wrong button on the GPS), ma and I started heading west. 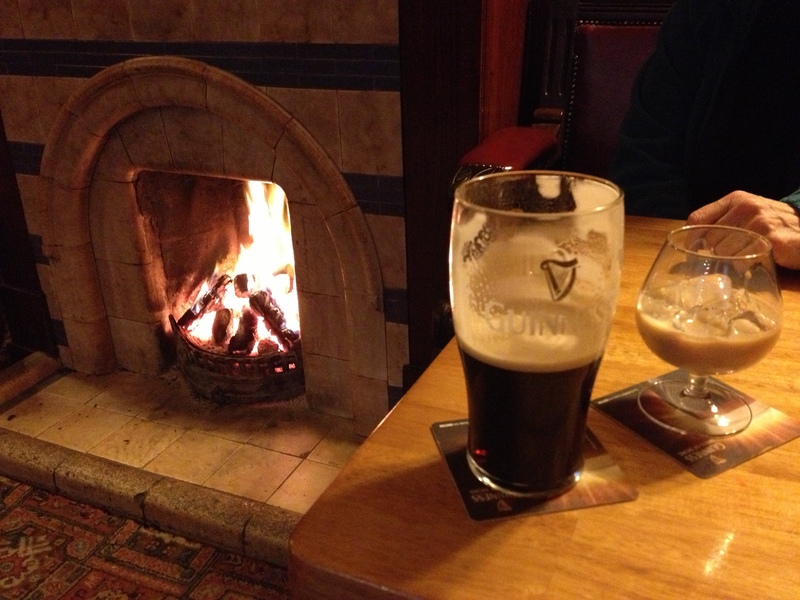 We stopped at a town called Macroom for lunch, finding a booth at a darkened pub. That was where we were sitting when the news broke of Margaret Thatcher’s death. I know this was news everywhere, but it was especially huge in Ireland for obvious reasons. Over the next few days and nights whenever we’d catch some TV, we’d learn more about how the Irish felt about Margaret Thatcher. Spoiler alert: not positively! 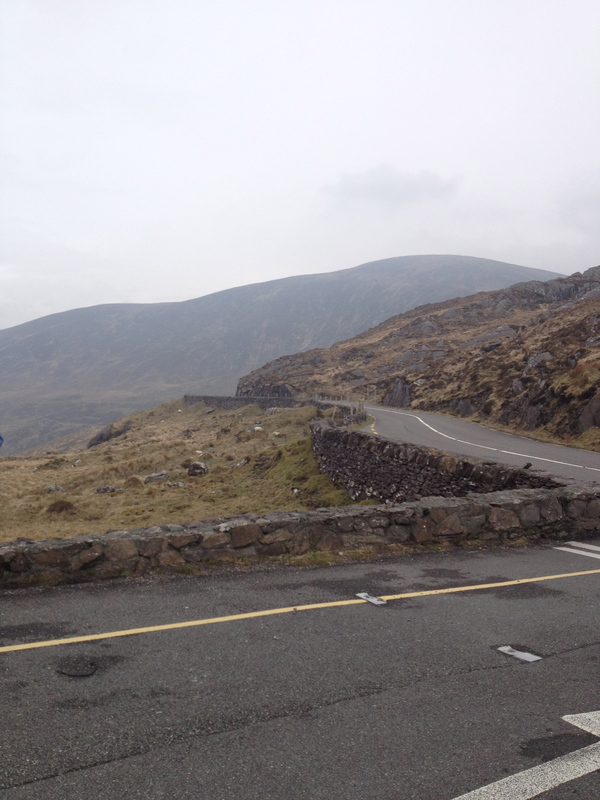 After Macroom, we were back on the road to Killarney. Now, our travel bible during this trip was Rick Steves’ Ireland 2013. It was a great guide, but Rick strongly hates Killarney for being too “touristy.” He’s right, Killarney is a tourist town, but there’s something to be said for towns built with sidewalks and crosswalks and nice hotels and shops. We stayed at the Arbutus Hotel, which was lovely and had a nice pub downstairs. Anyway, we were really only using Killarney as our starting and ending point for the Ring of Kerry coach tour. I’m glad I chose to book us a coach tour rather than try to drive it myself, because we would not have known all the great places to stop, and I wouldn’t be able to enjoy the views while driving. I would be too busy having a heart attack. Actually, this was a pretty great road compared to some – two lanes and everything! 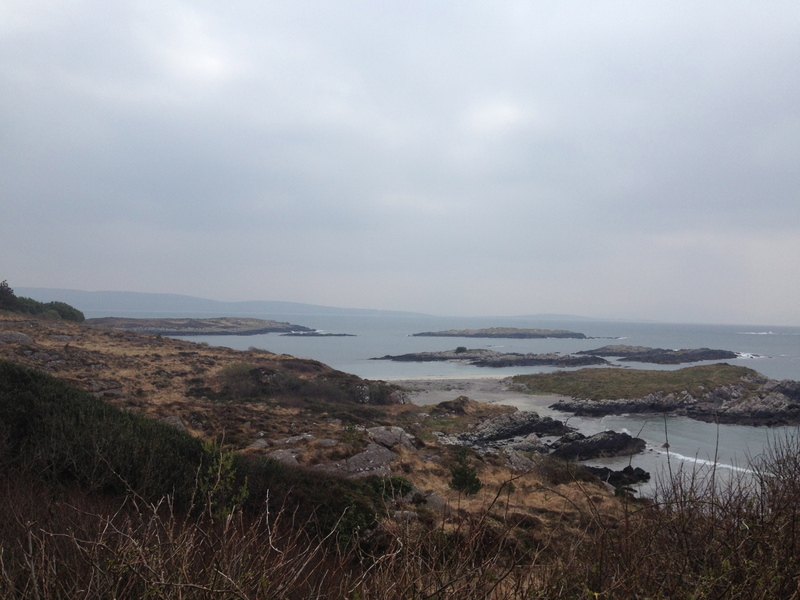 The Ring of Kerry tour took all day and was well worth the 20-ish Euros we paid. Our guide was charming and knowledgeable and said things like “there’s a castle well-clad in ivy” like it was not a very amazing thing. One of the first stops was at a bog museum and featured live music and dancing. This would not be our last encounter with bog turf. 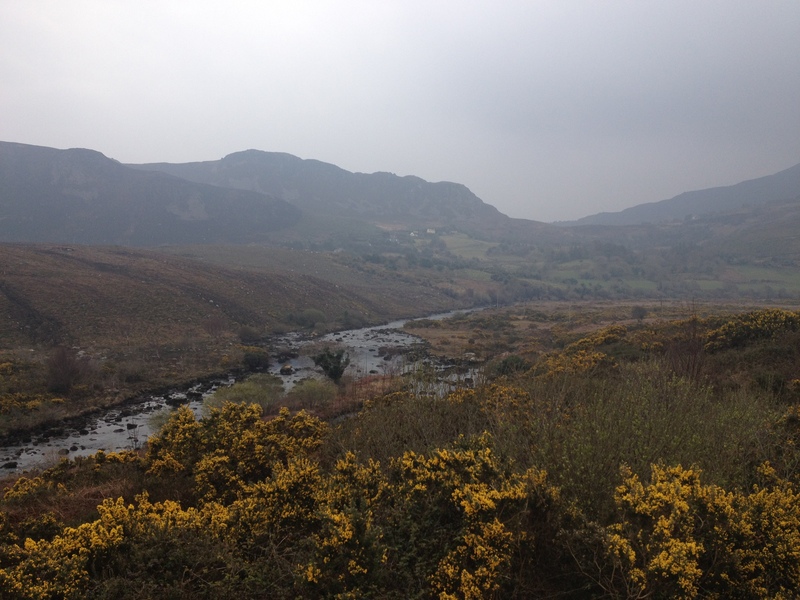 The Ring of Kerry tour makes a loop around County Kerry (that much was probably obvious), stopping at ridiculously scenic points along the way. The pictures can’t really do it justice, especially since it was a bit foggy, but trust me when I say it was breathtaking. We were in Kerry during lambing season, so we saw literally thousands of lambs (and I got pictures of none of them). They were cute, but ma and I were seated in front of a woman with a strong New York accent who wouldn’t stop talking about the cute lambs unless it was to berate her husband. I named her Debbie. At one point we were able to hold a lamb; ma and I chose not to, but Debbie did and continually said it was “the best paaaht” of her whole trip. Until, that is, a few hours later, when she realized she smelled like a farm animal. 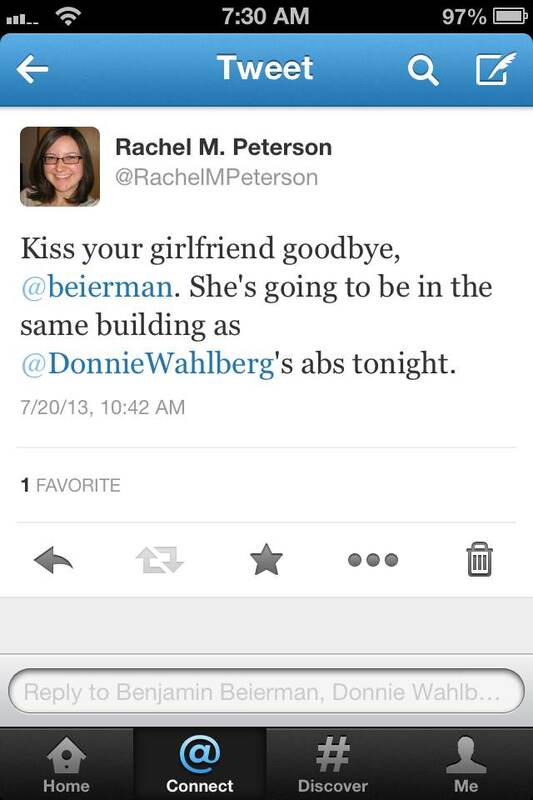 I’m sorry for laughing at this, Debbie. And thank you for making me grateful I chose to rent a car and not have to put up with other people for our entire trip. 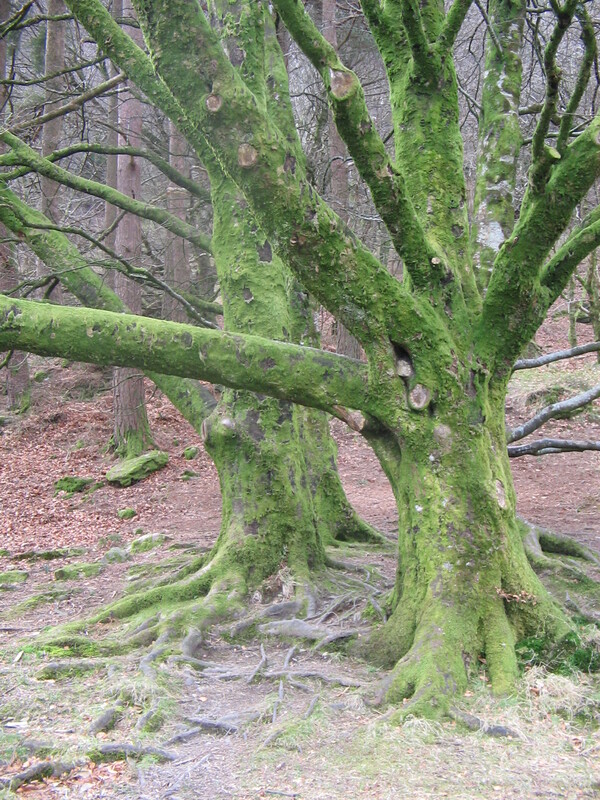 You could tell me that the Garden of Eden is hidden somewhere in this national park in Ireland and I would believe you. Especially since we also learned that Michael Fassbender grew up near here. Sounds like paradise to me. Our third day in Ireland started with a farewell to our first B&B and a hello to our new traveling companion: our Happy Europcar! We also sprang for the British-lady-voiced GPS. We would not have made it far without her. Frankly, we wouldn’t have made it out of Dublin without her. 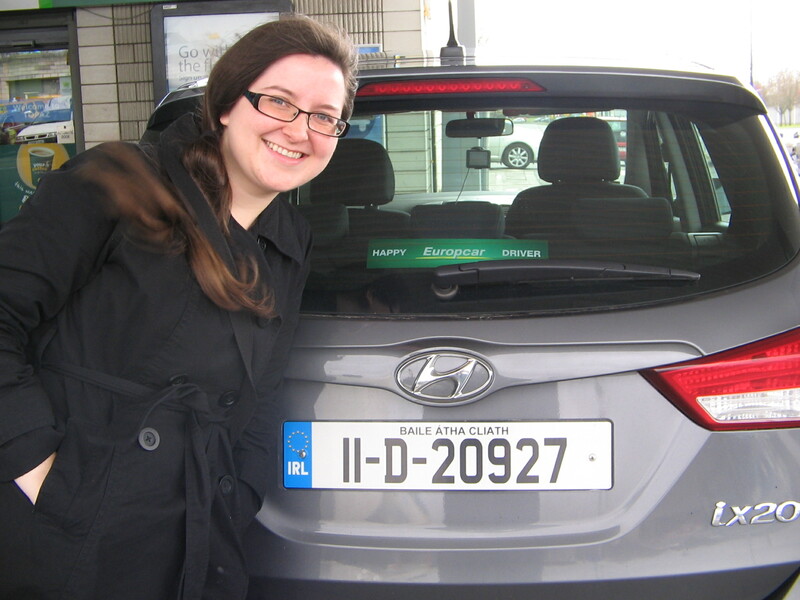 Here’s what I would recommend about renting a car in Ireland: 1) Do it. 2) Go through Irish Car Rentals. 3) Get all the insurance. All of it. 4) Learn where everything is on the car before even taking it out of park. 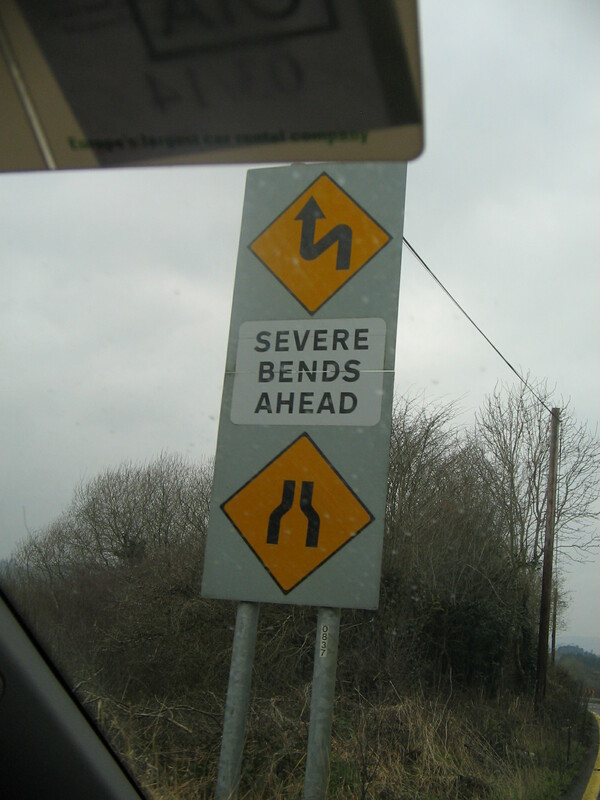 5) Learn about Irish road signs before you even get in the car. Guess which two of these things I did not do? I figured out how to turn on the windshield wipers ten minutes after it started raining, how to open the gas tank five minutes after we pulled up to the pump (and then only because a kind Irish stranger offered help), and how to switch off the lights two hours after I accidentally left them on. But I figured out the radio right away. 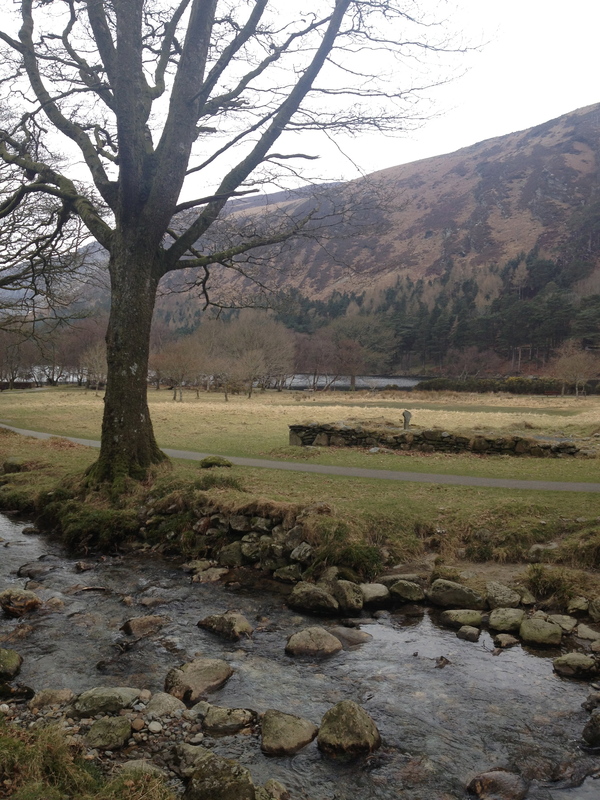 Our first stop out of Dublin was Glendalough. My friend Aimee recommended we visit it, and we were not disappointed. I took this picture. I know, I’m shocked too. 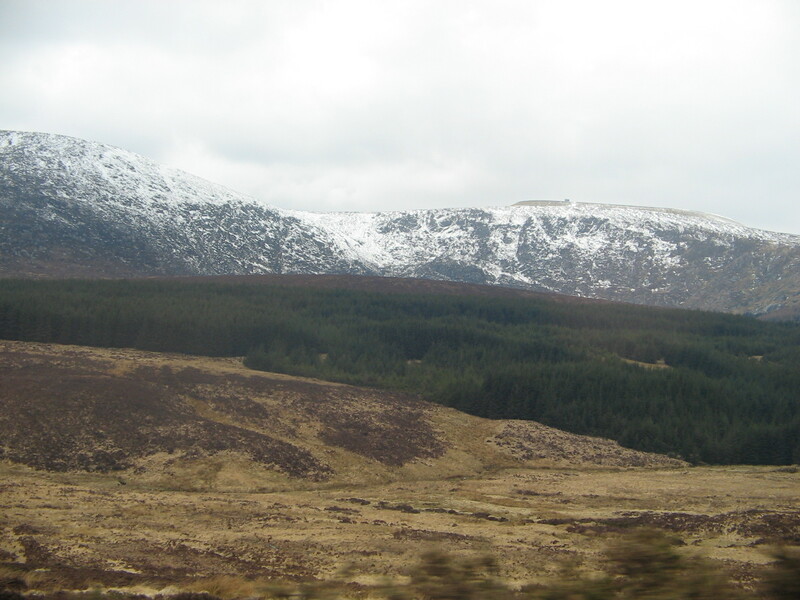 It was maybe an hour from Dublin (the way I drove), in the Wicklow mountains. We hiked to one of the lakes and climbed around some ruins and basically decided there are shades of green in Ireland that do not exist anywhere else on the planet. Even on an overcast April day. 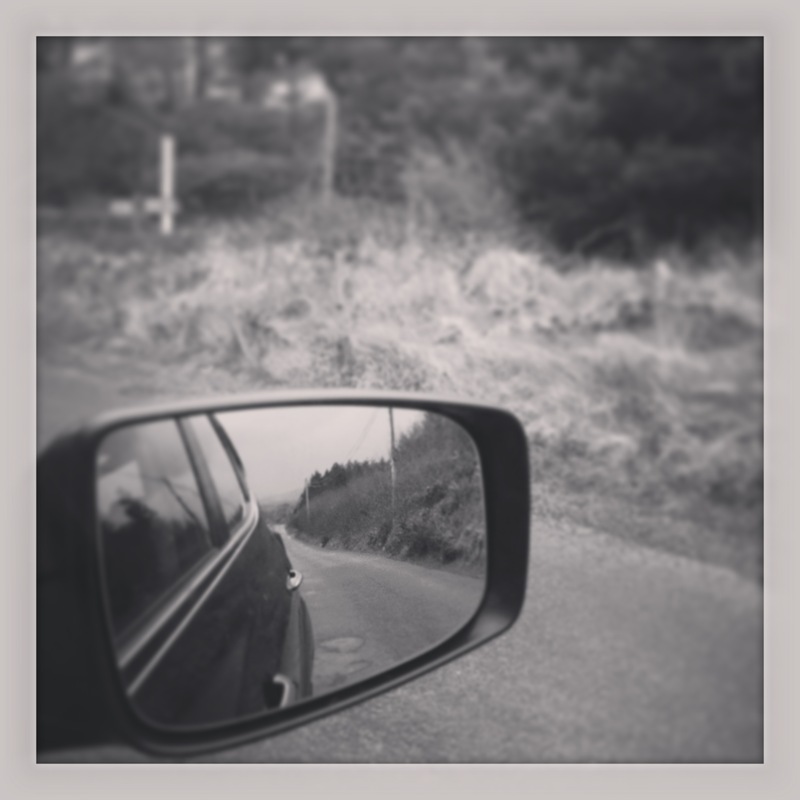 After Glendalough, our British Lady took us on a meandering path through the Wicklow mountains, which is great for your first day of international driving. Actually it was fine, and I really enjoyed the scenery that was directly in front of the car. Whatever was out the side windows was completely lost to me. It looked something like this, I guess. The last part of day three’s drive was actually just freeway, and very easy (until it started raining and I couldn’t figure out how to see for a few minutes). 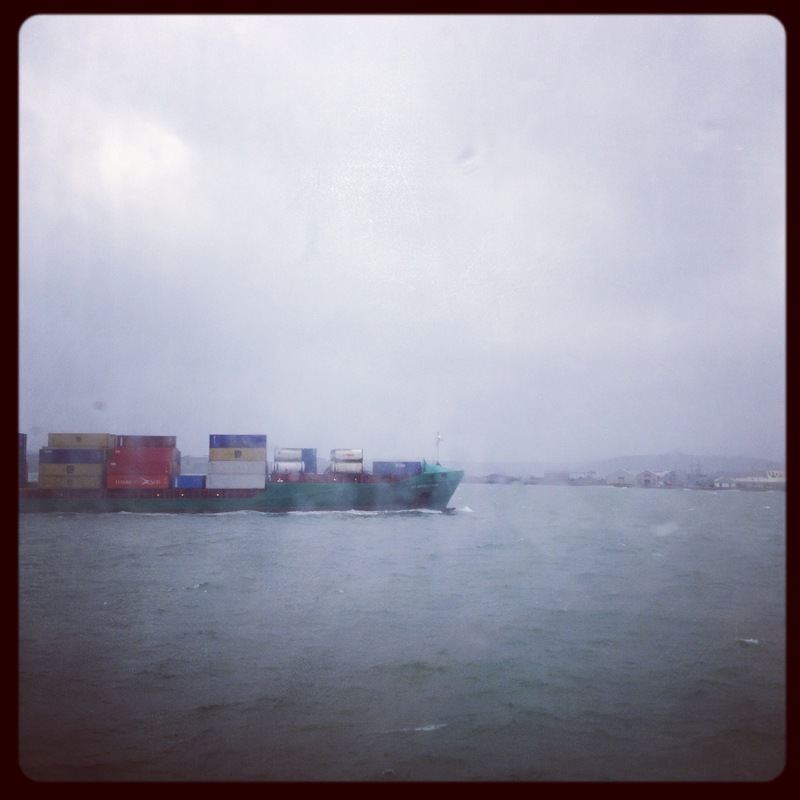 We arrived at our next stop – Cobh – around 5 p.m.
We arrived with wind and rain and found our hotel – the WatersEdge – with no problem as it is literally at the water’s edge. I followed the directions to the car park and for a panicky second thought they expected me to pull onto a boat at the end of a dock, but no – just make a very sharp left and park underneath a building on the edge of the sea! 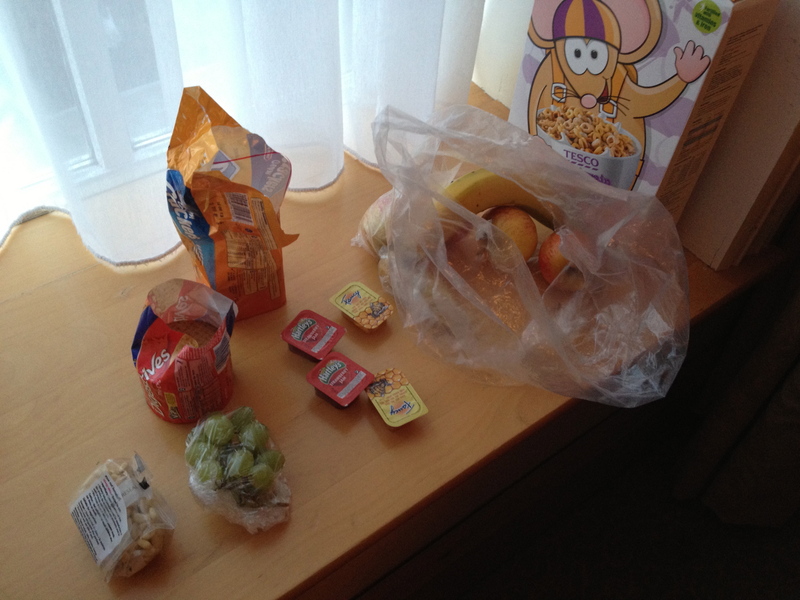 We spent the rest of the night at the hotel – eating dinner, journaling, and listening to the wicked weather. Cobh, formerly Queenstown, is a small town outside of Cork. I’ve actually been there before, but this time I knew what I was experiencing: the last stop my great-grandmother (Grammy), two great-uncles, and grandfather made in Ireland before they left it for good. My grandfather was just over a year, but Grammy was in her thirties and (as far as we know) had never left Ireland before. 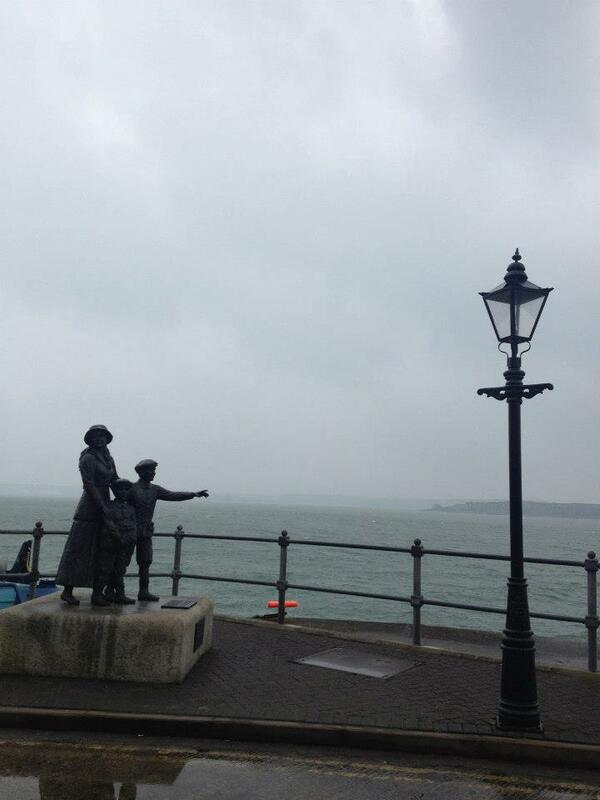 Cobh is also the port where Titanic stopped in Ireland. 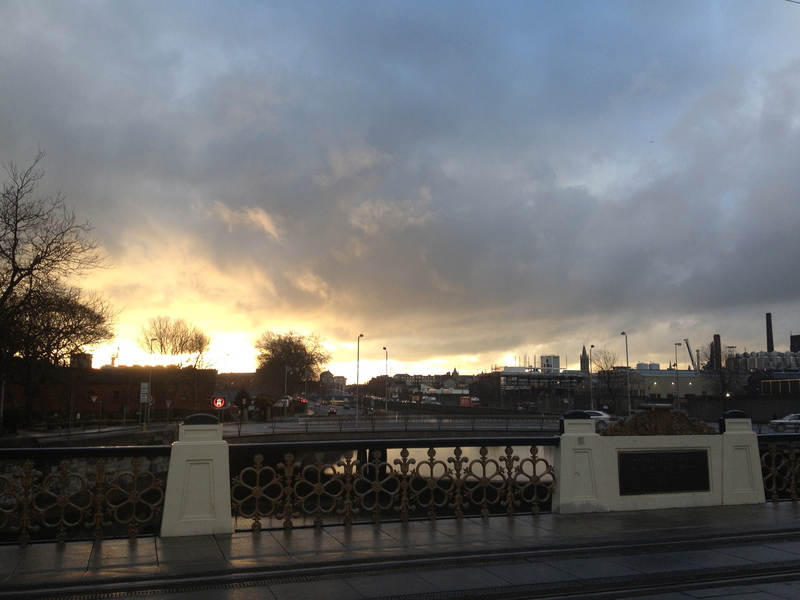 Call me a romantic, but the gloomy weather really seemed to match the history of the place. The next day, we went through the Titanic Experience – and we were the only two people there, despite it being less than a week from the anniversary of the sinking. I know a lot about the Titanic because I was an obsessive 12-year-old girl in 1997 – you’ll get there in a second – but this time I tried to think less about Jack and Rose (there it is) and more about what it meant to the immigrants who boarded ships after the Titanic sank, like Grammy. 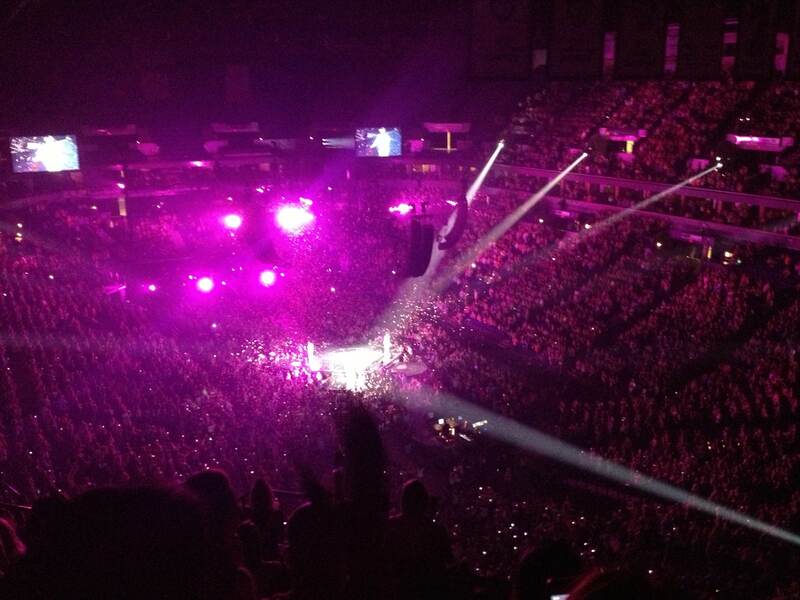 I would find it terrifying, so it’s lucky Grammy was not like me, or I wouldn’t be here. Annie Moore was the first emigrant processed through Ellis Island in 1892, and she departed from Cobh. 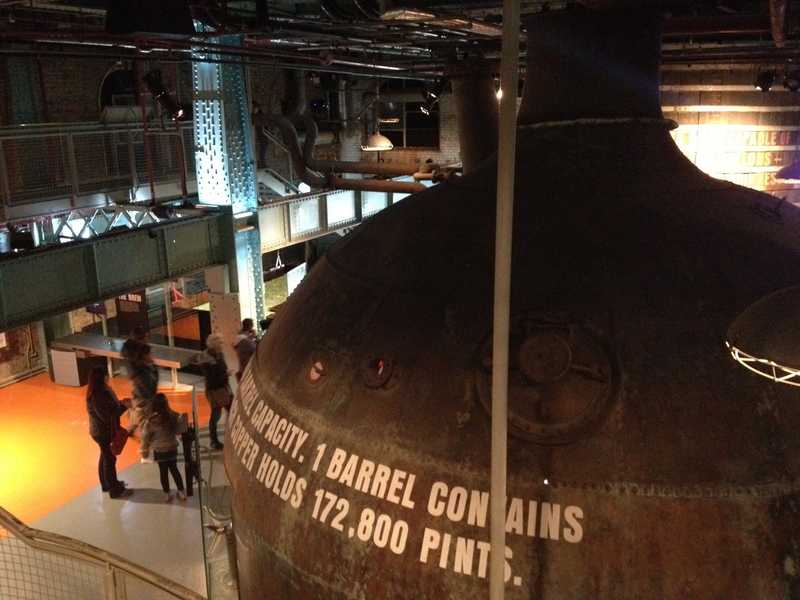 After the Titanic Experience, we went through the Cobh Heritage Centre, which is also right on the water. 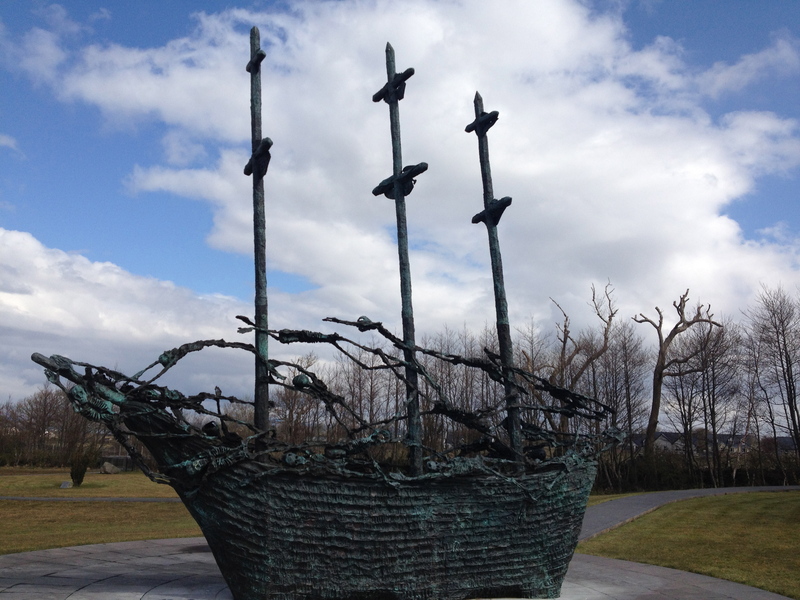 We learned a lot about the immigrants of various eras and the ships, including those full of famine victims and known as “Coffin Ships.” For the first time I wondered how my family actually lasted in Ireland as long as they did. Irish people had been leaving the country for fifty years by the time my family got around to it. How did they survive? And what finally made them leave?